A ho`omaika`i i ke kahua (groundbreaking) blessing was performed by Kahu Silva for a family before beginning a renovation project of their hale (home) on O`ahu. 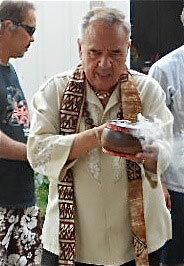 The dedication included the traditional pi kai ritual sprinkling of Holy waters with accompanying pule kahea (Hawaiian prayer chants) invoking the Ke Akua (the Divine Source), na `aumākua (the ancestral deities) and na kia`i (the spiritual guardians of the land) to sanctify the premises. 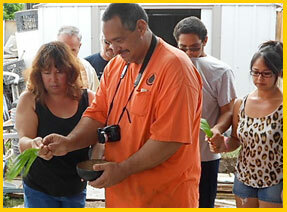 As part of every blessing, Kahu invited members of the `ohana (household) to share their mana (spiritual energy). After the blessing, a traditional feast with island foods representing the elements of earth, water, air and fire was prepared to honor the Akua and celebrate the occasion.